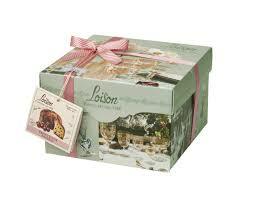 Loison is a master at its art and uses an ancient Milanese recipe for its classic Panettone – a low profile with candied cherries and Sultan raisins, hand cut at the top. This fragrant cake will arouse you with its aroma when you open up the beautiful package. The Genesi series offers a beautiful gift packaging and is part of the Top series of high quality products from this famed producer.